How to get there: Possibly, most people climb this mountain from the south, starting in the village of Vent. However, we came from the north, starting in Mittelberg, the end of Pitztal, a valley going south from the town of Imst. Route description: We started with the first (08:30 AM) funicular (a cable car train running inside the mountain) taking us to 2860 m just south of the mountain called Mittags Kugel. One can proceed higher with a gondola, but this is not advisable for the climb of Wildspitze. 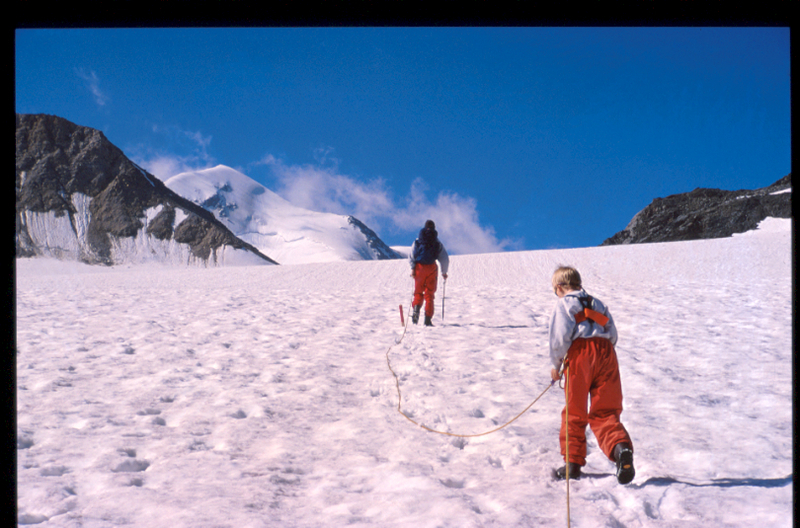 First, descend a bit less than 100 vertical meters across dirt and gravel to find good access to the Mittelbergferner glacier. Then across (south-west) this glacier, first fairly steeply, then only gradually climbing to reach the Mittelberg Joch (saddle/pass) at 3166m. This glacier had almost no crevasses when we where there. From the pass, one descends on a steep, but good trail about 60 vertical meter to reach the Taschachferner glacier. The route proceeds across (south-west), first flat, then fairly steeply up the (obvious) way between an icefall on the left and a heavily crevassed area on the right. 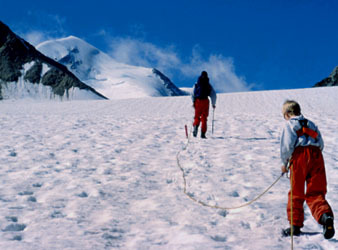 When reaching the upper plateau, the route heads more south-east and gains the north-west side of the summit. There were some hidden crevasses here that calls for caution. The route gains the west ridge to the summit. The last 50 m is on rock, with about 5m of light scrambling just before the summit. Comments: I did this climb with my sons Pål Jørgen, age 10, and Tor Erling, age 17. Our route was a bit "polluted" by skilifts on the first glacier, however the hike from the Mittelberg pass to the summit was very nice. We made the round trip hike in 7 hours (with my 10 year old boy Pål Jørgen), with time to spare for the last cable car return to Mitteltal. One can avoid the cable car by starting from the Braunschweiger hut, this hike is a bit longer and one should therefore hike to the hut the afternoon before. The view from the summit was very nice. The summit has a large cross on its top. One can also traverse to the lower north summit, this was quite easy when we where there. The ridge is slightly corniced, but involved no technical difficulties.